George Sloan leads AT&T’s international data, voice and IOT solutions organization responsible for more than 250 carrier relationships across 175+ countries. His team has office locations in more than 30 countries. Previously, George was responsible for $40B of AT&T’s procurement of infrastructure and consumer products including logistics of mobility handsets and customer premise equipment. 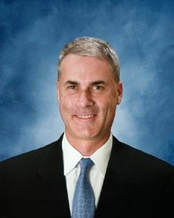 His career has included operations and planning roles for NCR, McCaw Cellular, Cingular, and now AT&T. He holds a Bachelor of Science in economics from the University of Michigan and a Master’s Degree in Business Administration from Michigan State University. George lives in Atlanta with his wife and three children.